It is with great pleasure that we record that our secretary John Keohane BEM has been made a member of the Royal Victorian Order (MVO). John has been a member of the South Devon Railway Association ever since he joined the army and was at Denbury in South Devon but due to operational duties around the globe his involvement with the railway was limited to being one of our guards. When he retired from the Royal Corps of Signals he was able to become more actively involved in the SDR firstly as the London Group secretary and then the Association secretary. 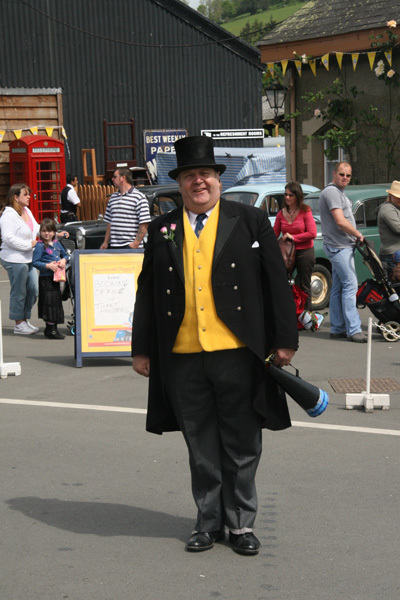 As shewn in the photograph above he is better known to our younger visitors these days as Sir Topham Hatt when Thomas the Tank Engine and friends make their visit to the railway over the spring bank holiday. The award of MVO (Member of the Royal Victorian Order) is one of the awards in the Sovereign's personal gift and has been awarded to John in the 2011 Queen’s birthday honours for his work at Her Majesty’s palace and fortress, the Tower of London, as Chief Yeoman Warder.